Flood research facilities are locations scattered throughout the galaxy where the Forerunners attempted to find a cure or a solution to destroy the Flood. There are various types and sizes of Flood research facilities. In accordance with the safety protocols of the Conservation Measure, these research centers were almost invariably built in remote locales. Containment Protocols were another integral part of the security in Flood research facilities. 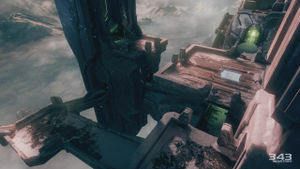 Many Flood research facilities were built on the Halo installations, including the Library structures, the Cold Storage facility below Installation 05's surface, and the Lockout facility, suspended in a mountainside. One facility was built in a gas mine in Threshold's atmosphere. Installation 00 is known to possess at least one Flood research facility. Installation 07 was home to numerous Flood research centers. These facilities were originally operated by Master Builder Faber's forces and the Lifeworkers under their charge, until the Primordial and Mendicant Bias took control of operations on the Halo. To the human population transplanted on the ring, these facilities were known as "Palaces of Pain" due to the brutal experiments committed within. Some facilities have their own Monitors and unique types of Sentinels, such as Line Installation 1-4, a sprawling underground complex on an unidentified moon. Installation 05's Cold Storage facility also had its own type of caretaker AI, suspended to a ceiling. It can be assumed that other research facilities are still scattered throughout the galaxy, alone or on the interior of other Halo rings. Unfortunately, the research facilities were unable to find a solution, other than finding that the Flood was susceptible to starvation. Thus, the Forerunners had to fire the Halo Array in order to eradicate the Flood threat. Now, these facilities have either been destroyed, or are uninhabited by sentient life. Installation 05 experienced a breach in its Flood research facilities around 97,000 years before the Battle of Installation 05, releasing the Flood in certain areas on the ring.